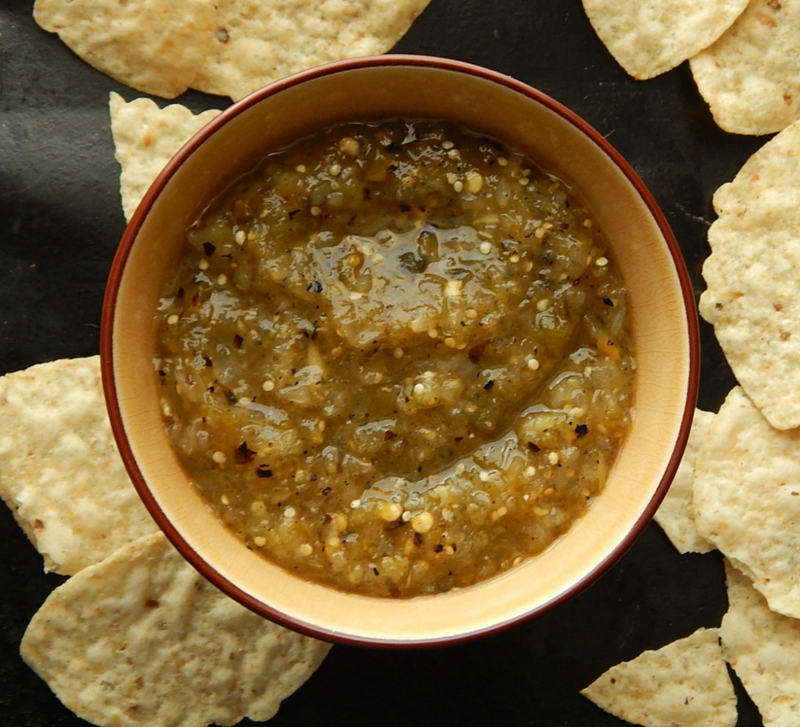 This Fire Roasted Tomatillo Salsa might just be a revelation to you. It’s a fantastic salsa, a blend of bright, tart tomatillos, jalapeno for a bit of bite & onion for depth, plus I’m giving you all my Fire Roasted Tomatillo Salsa secrets! There’s a little change up to my Fire Roasted Tomatillo Salsa that’s pretty unique. You might notice while the color is green like most Tomatilla Salsas, this leans a bit toward the golden side and the salsa is just a bit thicker than some. That makes it a little better for dipping but really translates to mo’ flava! The flavor of my Fire Roasted Tomatillo Salsa is not only spot on but also has an intensity that most tomatillo salsas lack. The smell, alone, when that sauce simmers will make you crazy, let alone the taste of this salsa! See, when making tomatillo salsa, the tomatillos and other veggies are roasted, but then they’re usually simmered in a broth. No one wants a raw tomatillo, trust me on this. So that’s the time-honored and traditional way. And yes that traditional way is good, but I really wanted my salsa just a bit thicker, not as brothy. Since I wanted my wanted my tomatillos, which I’d roasted with such care, to keep their freshness. I strained the whole works, poured all the juices back in the pan and reduced them. I stepped away and came back to an almost a caramelly syrup. Of course, I just about freaked when I came back to the pan and saw that syrupy substance! What had I done! But what started as a mistake, is now my go-to method to make my Fire Roasted Tomatillo Salsa. You can see why, I think in the photos. Maybe tomatillo salsa isn’t the prettiest thing in the world but you can this looks good! And it tastes just as good as it looks. Any Salsas might start out with a recipe, but even the most standard usually become a personal thing. Most people develop a kind of signature go-to method of tasting and doctoring to get their salsas just the way they like them. I like to make a lot of my salsas with a pinch of sugar, a sprinkle of salt, just a few dashes of vinegar to wake things up and a little lime to finish it off. That extra little touch of sugar and vinegar intensify the lime and give just a bit of sweet-sour tang that’s barely noticeable but makes such a difference. As far as heat level? That’s another personal thing, right? I’ve learned that jalapenos vary a lot in intensity. They used to be kind of spicy, but in the past decade or so, it seems you never know what you might get, mild to very hot. So whenever I make Salsa, I buy several jalapenos and roast them up & peel them all at once. Then I can add as few (or as many) jalapenos as I want to my salsa, and bonus! I can easily make salsa at a whim because I have a stash of roasted jalapeno in the freezer. Freeze them solid, and then add them to a Ziploc. Even with the variances in heat, I think a good rule of thumb is one jalapeno to a pound of tomatillos for very mild salsa, two for mild, three for medium, four for medium hot and so on. I usually use four because I like a good bite. Your mileage may vary. Just FYI – this recipe is not tested for canning. I’ve yet to find a better place to buy both the tomatillos and the jalapenos and now that I think about it, the onions for my Fire Roasted Tomatillo Salsa than Aldi. Really the prices are great. As far as Jalapenos at Aldi, generally they come in a small bag or a package, so you can’t buy just one or two like you can at the grocery store. If you follow my roasting them all and freezing them, that’s not going to be an issue. If you don’t have an Aldi unless you live on the west coast or southwest, you might be hard pressed to find any tomatillos, so it’s likely you’ll just have to pay for them as is; sales are unlikely. Place tomatoes, jalapenos, onion and garlic on a lipped tray lined with aluminum foil. Arrange with the larger items on the edges and the smaller items lined down the center. Onion should be cut side down. Place under broiler on high, and place tray five inches or so below, generally the second shelf down. Broil 10 to 15 minutes until vegetables are slightly charred, turn and broil on the second side. Check these often, turning and removing as needed. Cool until easy to handle. Remove stems from tomatillos and peppers and the seeds from the peppers if desired, working over a bowl to catch the juices. Remove skin and stem from onion and paper from garlic, if using. Add all vegetables to food processor, reserving any juices. Process to desired chunkiness, generally three or four short pulses. Remove to a strainer over the bowl to catch the juices, and set aside the tomatillo mixture. Place the juices and chicken stock in a pan, heat over medium-high heat and reduce until there is about 1/2 inch of syrupy reduction in the bottom of the pan. Watch carefully toward the end, this goes quickly, several minutes at most. Add the tomatillo mixture to the pan along with any additional juice, stir to mix. Add vinegar, salt, and sugar. Add lime if desired. Taste and adjust seasonings. If you broil extra jalapenos, you can taste for the level of heat – just add more if you want more and freeze the rest for later. This is not a recipe that has been checked for the proper acidity to safely can in a boiling water bath. If you like cilantro, add it in when the vegetables are pulsed. Maybe you’d like to see a few of my other Salsas? Here’s just a few to whet your appetite! Check out my pages for both Appetizers, Starters & Munchies and for Condiments & Sumpin’ Sumpins’. This entry was posted in Click here for Fabulous Food Posts and tagged Appetizer, Condiments, Hot Peppers, Jalapeno, Mexican or Southwestern, Salsa, Spreads and Dips, tomatillos. Bookmark the permalink. This looks epic! Thanks for sharing! Thanks much! That’s a great word to describe them…seriously, once you’ve done this you’ll fall in love! All about the Eco !! Thanks Gina! Comments make my day, so I’m glad to hear it! Love all your different kinds of salsas! Now I have to look for tomatillos! If I don’t find them, maybe I will try with Roma tomatoes. Thanks so much! There’s a Fire Roasted Red Salsa, too. I think the link is on the page. 🙂 I love salsa, there’s one for every mood and dish. Thanks, Natalie – I hope you like it as much as we do! not seeing any mice in this one either? sadly we cannot get tomatillos here, I have substituted green tomatoes although never having had a tomatillo I have no idea if that is a fair substitute but the results are always ok! 🙂 And thank you for all the compliments! I have several salsa recipes on here; check under favorite recipes at the top of the page, scroll down to condiments! I’d love to hear how you like them if you try one! In my opinion, you can’t go wrong with roasted tomatillos, chiles, garlic or tomatoes in a salsa! Your salsa looks delicious! OKay okay, I’ll bring the (desebrada carnitas), shredded pork, and the corn tortillas. When do we eat?!!!! Wow, I REALLY think I’d be getting the better end of the deal, there! 🙂 I think you’d like my Pollo Deshrabo, Chicken Tinga. You’d probably want a lot more Chipotle in it! I’ve always found tomatillos and the products made with them a big disappointment. Your salsa sounds delicious but I’d have to give making it a pass. I’m with you 100%! I have found many of the dishes with tomatillos that have popped up around the last 15 years or so to be a big hiss boo! While despise might be a harsh word, I have tried many and heartily dislike a lot of them! This salsa is quite a bit different, though – if you were at my house, I’d coax you to try “just one bite!” ha ha!